After a first season in LMP2 category of the European Le Mans Series, Team Duqueine Engineering will their second year with a new driver line-up. 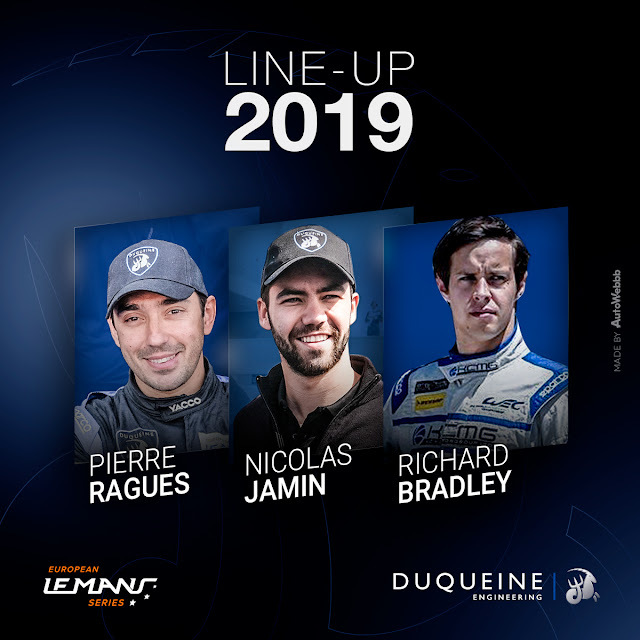 French drivers Pierre Ragues and Nicolas Jamin are still part of the Team and will be joined by Richard Bradley, winner at the 24 Hours of Le Mans in 2015 (Team KCMG LMP2 category). The 27-year-old British driver, who is used to performing in that category, will make the crew complete, as they are more motivated than ever and look forward to starting the season at the wheel of the Oreca 07 number 29 next April. Yann Belhomme, Team Manager of Duqueine Engineering said "I'm delighted to see such a quality Team ready to race in LMP2 for the second year in a row. It is with great pride and motivation that Team Duqueine Engineering will start this new season of European Le Mans Series. There is no doubt that we will be a force to be reckoned with in this tough competition!"